That’s baby Max in my arms. Oh my goodness, look how tiny he was. Just weeks old. We don’t own our home. We’ve rented the house that we currently live in for the past two years. For the longest time I’ve let the fact that we are renters kind of bother me. I’ve always attached a stigma to it, like our house isn’t as special because we didn’t buy it. I’ve held onto the notion that since this isn’t our forever home we don’t need to make it perfect, because we won’t be here long term. But here’s the thing. We live here now, we are creating memories and this is our space, right now. To my children, it’s all they know. We brought Max home from the hospital to this house, he crawled to us in our living room and he took his first steps in our kitchen. The boys wrestle, run, snuggle and sleep here. 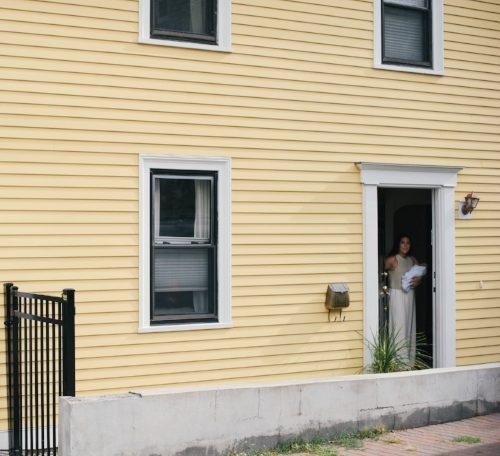 This bright yellow house has wrapped it’s arms around us and to be honest, even though it’s small and old, I kind of love it. We are here now and we deserve to have the space work for us. Life shouldn’t be lived waiting for when the time is right. So as I was stuck in my own issues of renting vs buying and caught up dreaming about my suburban home, things slipped out of control right underneath my own nose. The thing is, I consider myself an organized person. I actually find great joy in cleaning, organizing and decorating. But with two small children, a busy career and a husband who does not share my passion for putting things away neatly, I quite frankly felt buried alive in our “stuff.” Suddenly every project just seemed really big and would require hours of (child-free) labor that I didn't have. And this killed me. At times I actually felt like I was suffocating inside my own house. The exterior of each room was in great shape. I can’t stand to be in a space that looks messy and cluttered. But what I can deal with is putting it away behind a closed door. So if you walked into my kitchen you’d probably think I had it all together. Then you’d open the cupboard and see the real deal. And this bothered me. I felt like a phony. It actually gave me anxiety on a regular basis to not be able to find things I knew I had and to dislike how things flowed when I opened the door. This is more than organizing - it’s emotional (at least for me!). Then in walked Aggie. Aggie is the founder and owner of PRIM - a Boston based personal organizing business. PRIM stands for “Spaces Purposefully Reimagined to Inspire Mindfulness.” (Um, hello how incredible does this sound. Yes please!!!) The mission of the company is something I believe in, but the real pulse of the plan is Aggie. Aggie is one of those people you just want to have around. She has this cool, comfortable vibe that wraps around you and makes you instantly feel like you are in safe, good hands. She has an innate ability to read people and jump right in, somehow knowing just what they will need and how to make them happy - even if you just met. She's like a personal assistant, chic influencer, CEO and best friend all wrapped in one. I know it sounds like I’m singing her praises and I am, because I am so impressed and inspired by her. There’s no agenda here, she’s just a genuinely great person with a gift that should be shared. Inviting someone into your space is a deeply personal thing and it takes a person with a special kind of touch to handle your things with respect and love. And that’s this woman. After the initial consultation, Aggie dives right in. Phase one of her process is no joke. She takes every single thing you own out of every single cupboard and drawer. If this is going to stress you out, you don’t need to be there. It’s overwhelming but also amazing to see how much stuff you really have. 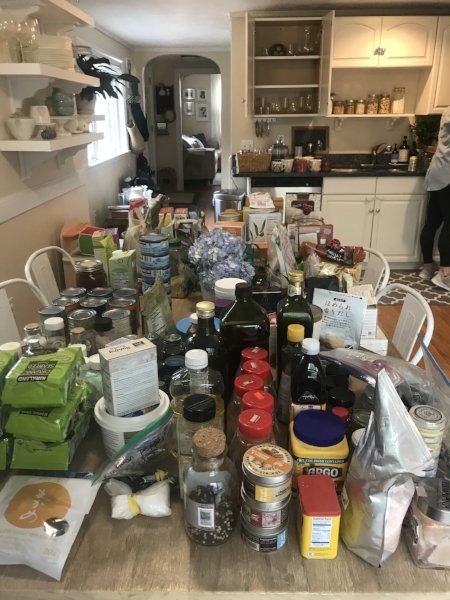 Surprisingly I was pretty calm seeing the contents of my kitchen spread out over every square inch of countertops and table. I think it’s because I truly trust Aggie. She does an inventory of what you have (this is also a great time for purging if needed) and she begins to group and re-place items. I left to do some work and just a few hours later every item was back where it needed to be. In my case Aggie did switch around the placement of a few of my cupboards. 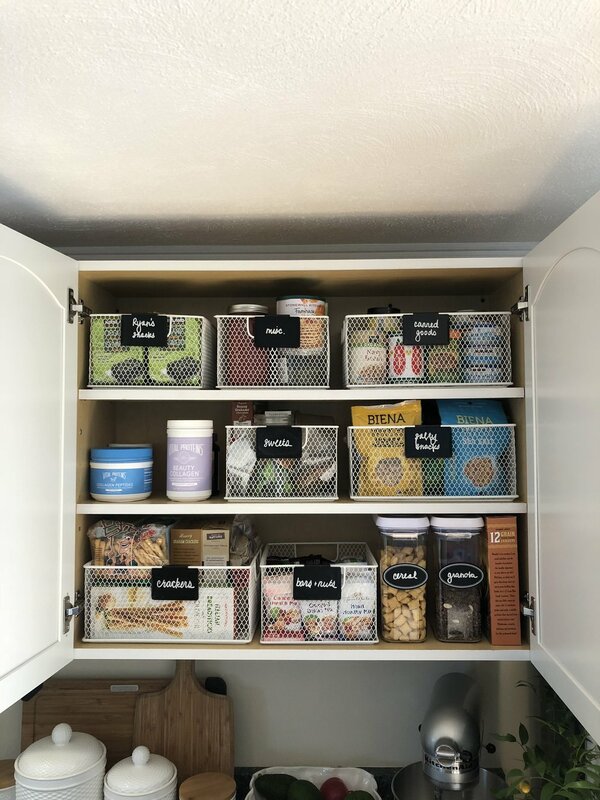 The way she stacked and sorted made complete sense to me and a few times I thought, “why didn’t I think of that.” We realized that I had baking tools and ingredients sprinkled throughout the kitchen instead of in one spot. Speaking of sprinkles, we also determined that I have a lifetime supply of them plus cookie cutters for every occasion. What I loved is that Aggie doesn’t pressure you to get rid of anything, she leaves that part up to you but she does make suggestions in a kind way. If Aggie had left me with only this on this day I would have been thrilled. My kitchen was neater, flowed in a more efficient way and looked a lot less cluttered based on her set ups. But she wasn’t done yet. Next up she measures all of your spaces and goes shopping for the necessary containers, bins, baskets, etc. This takes things to the next level. She asked for our budget and set off to make her purchases at The Container Store. I actually was leading a teacher training the entire weekend she came and put everything together. If it was anyone else I would have been super nervous and likely asked to be there with them. But with Aggie, I was actually excited for the surprise. And she didn’t disappoint. I can’t tell you how amazing it was opening up my cupboards and seeing how pretty everything looked. White, crisp, clean, labeled, organized. It was love at first sight. Aggie spent about $400 on the items she purchased and they are worth every penny. I’m not even worried if they don’t work perfectly down the road in our future home because they are so universal I can put them to use anywhere. She returned everything that wasn’t needed as well. We’ve been living in our newly re-organized kitchen for about a month now. I was honestly worried that Ryan wouldn’t be able to ‘maintain’ the system but much to my surprise he has. I think that’s because it’s simple and makes sense. Everything has it’s home and it’s just as easy to place it where it belongs as it was to throw it behind closed doors. Ryan has even remarked that he is more versatile with his cooking because he can actually see what he has to work with, which leads to more experimenting and more deliciousness for me! Is it worth the money to pay and have someone come help you? Well, that depends. Maybe have an honest talk with yourself. Are you really going to do it yourself? Do you have time to clean things out, shift things around, go shopping, make returns, set it all up? How long have you been saying, “I’ll tackle that project when I have more time?” As a reminder, I said it for 2.5 years and finally I realized it’s not failure to get help. Even though I pride myself on being a certain type of person, the kind who can organize her life, I just can’t do it right now. Sometimes we just can’t do it all ourselves and when the outcome makes you feel lighter, happier, clearer and like a more efficient human - then yes, I’d say it’s worth it 100x over. Without further ado here are some before and after pictures. I never thought I’d share the insides of my cupboards on the internet but there’s a first time for everything. Head on over to Instagram to see the video story tour as well. Our tupperware area just piled into bins. All tupperware now has matching lid and grouped into bins that make sense for easy access. A catch-all cupboard for wine glasses, vases, etc. Now all my glassware is together. Pots and pans a mess. Neatly placed for easy access. Our every day dishes mixed in with kids stuff. Cluttered and not visually appealing. Pretty! Easy to reach and see. Kids stuff was moved to it’s own cupboard. Our always overflowing snack pantry cupboards. So much better. Now I just pull a bin down and grab and go. I also want to note that I did NOT throw anything away, other than a few misc items. 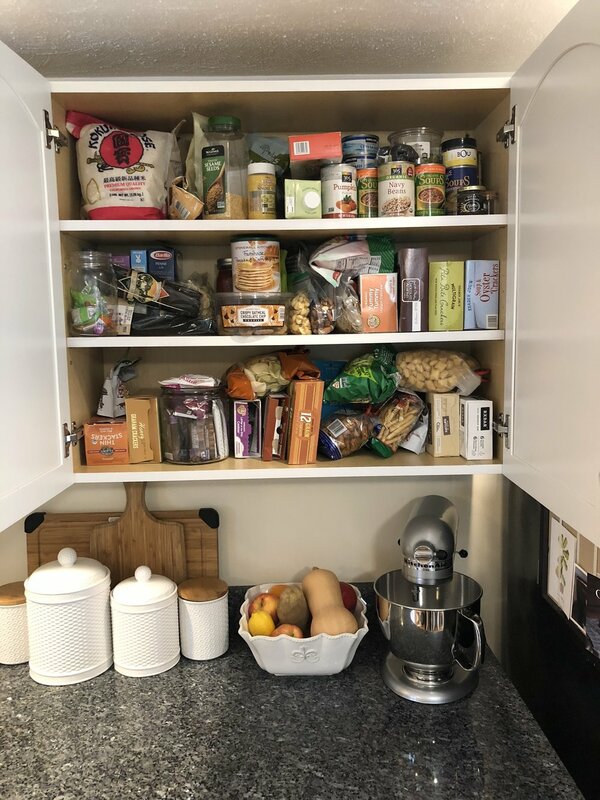 I have open shelving in my kitchen that helps to house some of my entertaining items and helps keep the cupboards free for other essentials. Things just look more spacious because of the way Aggie re-organized. 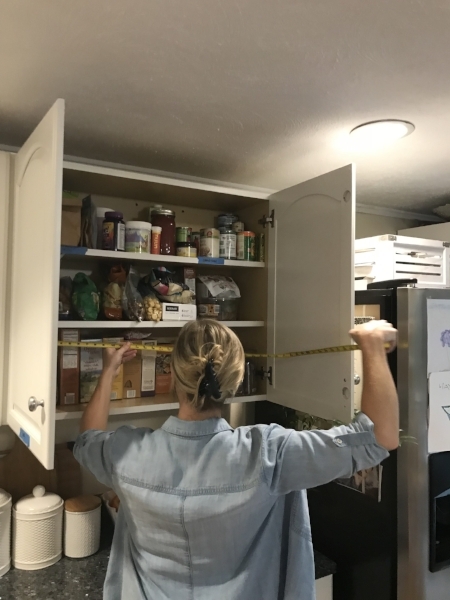 So there you have it folks… I know this isn’t my typical fitness related post, BUT creating and clearing space in your home, de-clutters your mind andddd frees up room for you to feel sooooo good which probably makes you want to workout more… see what I did just there?!? It’s all related people! If you live in the Boston area and want to work with Aggie, feel free to reach out to her directly. But be prepared - your life will change!! Aggie Hoover: primbyaggie@gmail.com. Follow her on Instagram at @PrimByAggie.